I’ve been trying to watch what I eat lately, I’ve been tracking my calories and have been more adamant about working out daily. Not for any specific reason other than to just feel a bit healthier. So, of course I’ve been fantasizing about all sorts of goodies and sinfully delicious treats since I decided to jump on the healthier band wagon. Why does this always happen to me? As soon as I decide I shouldn’t have something it’s the only thing I want, ha. What has been the biggest guest star in my foodie fantasies you ask? DONUTS. Ugh, they are just too delicious! I cannot resist these babies! Like anything in life, moderation is key, so I allowed myself to indulge a little (or a lot) over the weekend and then promptly took the remaining offenders to work to give to my coworkers. They were gone in under 5 minutes. Enjoy the recipe and feel free to get really creative with your icing and toppings. 1/4 tsp of your favorite food color or flavoring. – I used pink food coloring for half of my icing mixture and then topped the donuts with sprinkles. For the other half of the icing, I used Maple flavoring then topped the donuts with crispy turkey bacon. Fill each donut cavity 2/3 full. Immediately flip the donuts over in the pan after taking them out and allow to cool for 10-15 minutes then transfer to a wire rack to ice. 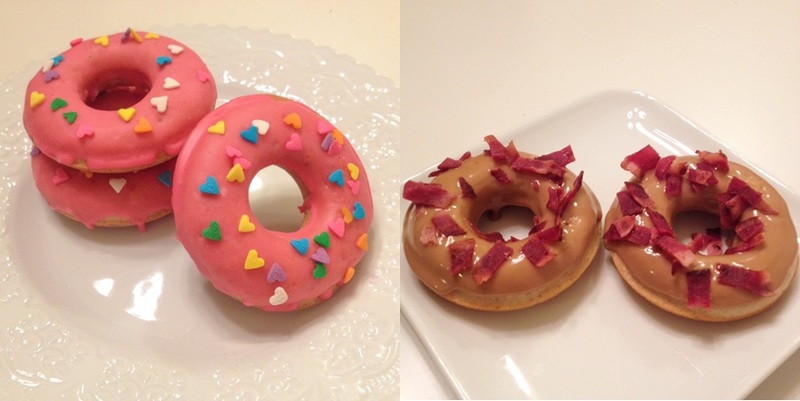 Dip donuts in icing then top with anything your little heart desires, like bacon or sprinkles. Enjoy! Yes! Must find a donut pan ASAP.